Do you have a legal question that needs answering? Ever wondered how the law applies to your situation? Dutch Games Association is here to help! 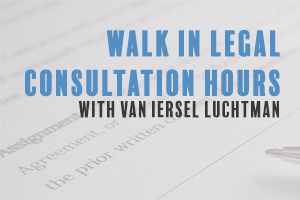 Every first Wednesday of the month our legal partner Van Iersel Luchtman will be present at our offices in Utrecht, from 14.00 to 17.00 to answer your legal questions during this consultation, free of charge. Drop by and get your legal questions answered by an expert. The walk in consultation hours are open for everyone, registering is useful but not required, if you like to register beforehand, use the form below. Nb. The walk in consultation hours as well as the primary advice given during the consultation is free and non-committal. If follow up activities are are necessary or questions can’t be resolved with primary advice a non-committal quotation can be requested from Van Iersel Luchtman for these additional activities. Van Iersel Luchtman is based in the Dutch province of North Brabant, with offices in Breda and ’s-Hertogenbosch. They are a no-nonsense law firm with a solid reputation, both in the Netherlands as well as abroad. With a team of 40 lawyers, they are one of the largest independent law firms in the South of the Netherlands and are flexible, critical and direct. VIL gets to the point right away, always is aware that honesty and transparency helps them build stable, long-term relationships. That is how they achieve great results together with their clients.